This is a somewhat unorganized rant on the subject of Sofar Sounds. I've had the pleasure of participating in three events through a global community called Sofar Sounds. They are a musical movement, hosting intimate concerts in living rooms around the world. nlike most preforming experiences, the artist has the opportunity to perform a short set for a lighted room of entirely QUIET music lovers. ! Newsflash!!!!! !… most venues, even performing arts centers, do not provide the same opportunity because the performer/audience relationship is never that intimate. I’ve had qualms with “performances” before, within many genre types. Sometimes performances can be circus-y. Calculated. Emotionally reserved. Perhaps even a situation where the audience feels alienated. Maybe that's what some people want!? However, my main intention is to communicate, share my art, and offer some kind of message. The most rewarding moments I've had as an artist are the ones where someone approaches me and tells me that I've made their life better, or that I've helped them see something more clearly. With an experience like Sofar Sounds, the opportunities for sharing and communication are endless. You sit right in front of someone who is listening to your every word, feeling your every harmonic move, and thus truly committing themselves to your musical moment. We are all afraid of vulnerability. To go to a concert these days is a social outing- much more than an intimate experience listening to an artists who moves you. Quit being boring, guys. I wish we would all treat live music performance like Sofar does. I’m sure some of you reading this are not hearing anything new, but for those of you stricken with guilt- just remember that people need art! No need to be weird about it. Go ahead and let it in. Be vulnerable with us! Commit to that shared moment! In today’s world it is harder than ever to be emotionally present and raw. I challenge you. I love Sofar Sounds! Artists love it! Audiences love it! It's like the most beautiful symbiotic relationship I can think of within the world of performing. Sofar is old school. Sofar will save us all. They truly set the stage (more like a living room corner) into a safe space where we can do things like change the way you think about something, or make you respond emotionally. Or even create tension… go ahead and hate my song! It's a two way street so we should all be in this thing. Let art serve it’s purpose and be enriching! I really appreciate the insight that Sofar Sounds has given to me. I encourage you to sign up for Sofar Sounds today. Get invited to a secret show in your hometown, and experience unedited creativity! Art! Sometimes my apartment gets so messy that I get CRAZY, so I made a point to get this book. The basic idea is to live minimally, and dispose of anything and everything that does not bring you the most extraordinary joy. No guidance re my musical instrument collection, but I'm quite happy with my clutter on that front. I've been a massive Beach House fan since my senior year of high school. Their work never fails to inspire, and of all my fav artists, I tend to get stuck on their new records the longest. I'm always SUPER moved by their total mastery of melody and low fi sonic textures. Beautiful music. New record is terrific. My fav track (right now) is the very first one, Levitation. Spring and Fall are equally beautiful as far as I'm concerned, but you don't need to buy new coats in the spring. Duh. 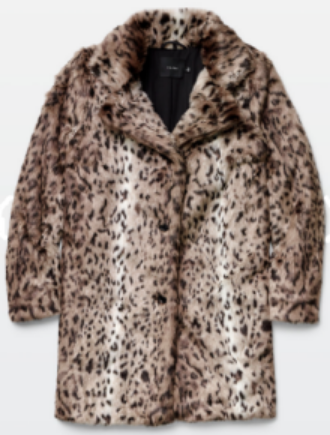 And this coat is making my childhood dreams come true. I'm the impatient freak walking around NYC in a coat that should only be worn when the air is 20 degrees colder. Those who knows me understand that I am very intensely obsessed with an East LA style Mexican restaurant on 6th Ave and Watts. It is called Lupe's. You will always be my no. 1, Lupe's. I used to live nearby, but a thirty minute train ride SHAN'T keep me from my tostada salad time. Here is a pic that captures it's essence! Photo by my great pal, Mike Brun. Thank you very much for taking the time to read my frivolous thoughts.